At 6’ 6” and 320 lbs., the question seemed to be where, rather then when, the 22-year-old undrafted rookie would get his shot at playing professional football. Over the summer, Hickman tried out with Cincinnati, San Diego and Green Bay before signing a contract with the Chargers in mid-June. “I was basically jumping for joy. My parents were there and I told them and they were super excited, maybe more excited than I was,” Hickman said of getting the call. Currently, Hickman is preparing for training camp at the end of the July along with 89 other Charger players. Make it out of camp and the former Wildcat has a place in the NFL, but there’s the rub. By the end of camp/the preseason, San Diego must trim its roster from 90 to 53 players. Nothing about Hickman’s contract is guaranteed, he said, like most rookie contracts, so if he wants to cash an NFL paycheck he has to survive this one last test. Majoring in engineering while at Missouri S&T is something that could help Hickman overcome this next obstacle and, in fact, he said that has done a lot to shape who he currently is as a player. Once he got a chance to prove himself in the rookie minicamps at Cincinnati and San Diego, that’s exactly what the HHS grad did. Hickman noted it took some time to get acclimated, mainly because he hadn’t seen that speed of some of the Division I guys playing at a smaller school, but he eventually did. 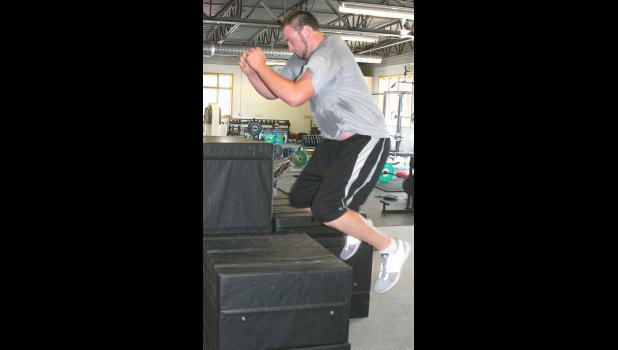 Prior to those camps and workouts, Hickman spent time at Simoneau Sports Performance in Kansas City with former NFL player Mark Simoneau and worked in town with former NFL strength and conditioning coach Russ Riederer in preparation for his shot at the NFL. Most of that time was spent on preparing for agility and speed tests, while lifting and strength exercises were another key focus considering one of the drawbacks of playing at a DII school meant having a less regimented lifting program. Holton High School football coach Brooks Barta saw the downside of that, but also felt that Missouri S&T may have ended up being the best fit as far as putting Hickman on this path. As hard as it may be to believe, Barta said Hickman initially hoped to be a basketball player and it wasn’t until his junior or senior year when he fully grasped his future in football. That late blooming allowed Hickman to focus on academics first while choosing a college and to progress at his own rate on the way to being four-year starter and a three-time All-Conference football player for the Miners, all setting up one of the biggest upsides regarding Hickman as a player, according to Barta. “The thing that he probably has that a lot of guys don’t have, especially at that position, is he’s very young and has a lot of potential for growth,” Barta said. To Hickman, the potential for a shot in the NFL started to coalesce prior to his senior season at Missouri S&T, when pro scouts were calling his college coach and showing up to practices. In his eyes, the draw was pretty basic, though he knows he wouldn’t have ended up here if it weren’t for the input and advice from his coaches and people like Riederer. Some of that advice includes focusing on himself more because the NFL is a business, so he knows he has to keep working hard and keep getting better. That was the idea behind working with Simoneau and Riederer, as Hickman took off the second semester of his senior year to work out twice a week (at least) with each to prepare for tryouts. Since signing with San Diego and attending the Chargers’ minicamp, Hickman has continued to work with Riederer before heading back to the west coast at the end of the month. What Riederer said struck him about Hickman from their workouts was his athleticism, which he says is above average to good for a player Hickman’s size. Riederer also compared Hickman to another Division II lineman, Valdosta State’s Ryan Schraeder, who he saw compete at the Raycom College Football All-Star Classic in Montgomery, Ala. a few years ago. Schraeder spent a year on a practice squad after being an undrafted rookie and went on to start at left tackle for the Atlanta Falcons this past season. Already, Riederer said Hickman has a better skill set and if given the same opportunity he believes he could thrive in the NFL. “If they give him a shot to develop in a two-year period, you can spend two years on a practice squad, then I think he’s got a chance to play 10 years,” Riederer said. Of course, it all comes down to work ethic. Riederer noted personnel departments for each NFL team will be scouring footage from exhibition games trying to determine which players could be a good fit on their practice squad. So, in some ways, Hickman’s work is just beginning, but he’s ready for the challenge and to see what the path ahead could hold. “I’m excited about the opportunity and hopefully it can lead into a future in the NFL,” Hickman said. Hickman will report to training camp in San Diego on July 29.